I knocked twice on the dark stained door at the end of the passage. A small hatch slid open. “Oxo,” I said boldly, standing on tiptoe. “Is the 1.15 off,” I enquired. “You’ve got a few minutes yet,” she said, dragging on her Woodbine. I entered the smoke-filled room where the usual crowd huddled around the ticker-tape machine, its stuttering chatter competing with the ringing telephones. This is the back room of Charlie Young’s Hairdressing Salon and, as a chirpy, skinny ten-year-old, my excessive enthusiasm for racing and betting has led me to be accepted by all the regulars. Today is both the last day of the 1946 Flat Season and the last day in the riding career of Harry Wragg, so consequently, my last chance to back him. Harry was the thinking man’s jockey, known nationally as ‘The Head Waiter’ because of his effective waiting tactics. He had been champion jockey in 1941, and ridden the winners of 13 Classic races, including three Derby winners – Felstead (in 1928), Blenheim (1930) and Watling Street (1942). He also had two younger brothers, Sam and Arthur who were both successful jockeys in their own right. Time running out, I quickly scribbled my first bet, 2/- win Tiffin Bell, (Harry’s first mount), and slid it across to Charlie’s lanky blonde wife Alice, who promptly secured it among 50 or so others in a giant bulldog clip. “Blimey, I’m off to a good start,” I squeaked. During the next 30 minutes, a pipe and two Capstan full strength passed through the security system and quickly contributed to the diminishing visibility. Continuing my loyalty to H. Wragg, I invested 2/- to win on Aprolon in the next, and made myself useful by taking a tray of tea and biscuits out to Charlie in the shop. 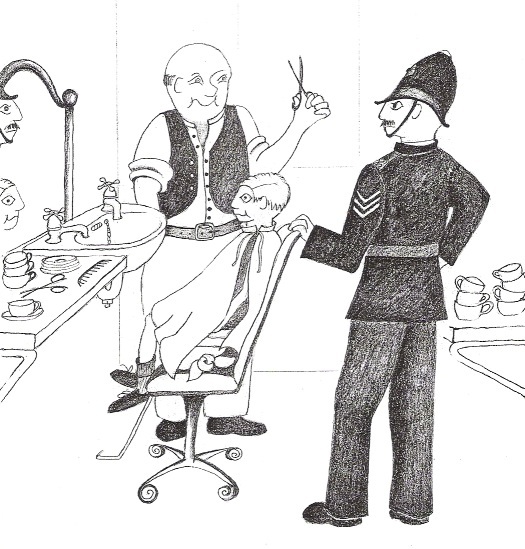 Charlie, a dead ringer for Alfred Hitchcock, often used his ventriloquist talents whilst cutting hair. “How’s it going young squirt?” he enquired, throwing his voice to the corner of the salon. I backed Tiffin Bell, won 5-2,” I boasted. 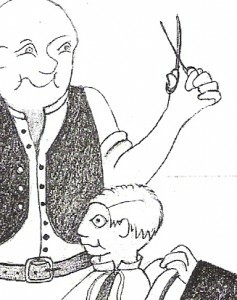 “Then you can afford a hair cut he replied,” still in the high squeaky voice. Ten minutes later I re-entered the betting room sporting a well-slicked head. “What are you doing in the big one?” she enquired. “Super,” I replied, and instantly returned the coin to his hand. “Put it on Las Vegas in the N-November Handicap,” I stammered. Two fifteen approached and the request for prices from the ticker-tape had the ring of an auction. Five to one Dornot – Rae Johnson; 100-8 Star of Autumn – Charlie Smirke; 20-1 Las Vegas – Harry Wragg. Arriving just in time for the big race, I recognised the voices of Uncle Arthur (Craven A), and Uncle Henry (Rothmans), through the blue haze. At this time, it was thought expedient by a health fanatic, to take the drastic step of opening a window an inch or two, as visibility had fallen to one pace, and it was difficult to hear the odds over the coughing. A stillness now came over the assembly, and strangely, the absence of a running commentary in no way diminished the excitement, as each man prepared himself for the instant finality of the result. The silence was finally broken by the sound of the ticker-tape. Taffy crouched over it assisting its passage like a midwife at a birth. “They’re at the back door Charlie,” Alice cried out. “Michael, put the plank across the arms of that chair, and sit up on it.” I obeyed instinctively. Charlie then put the books, cash and betting slips into a pillowcase, pushed it under the plank and threw a large white cape around me to cover everything. “Afternoon Mr Young.” The stentorian voice preceded the presence of two uniformed police officers. “Yes, usual Saturday afternoon you know,” Charlie replied, looking a little pale. “Alice looks as if she has been washing up cups for an army,” the sergeant added sarcastically. “Yes of course, we must try that approach down at the station,” he retorted. “Given up the betting, have you Charlie?” he persisted. “Yes officer, but all that’s in the past now,” said Charlie, riding his luck. The sergeant’s gaze turned to the customers. “Been waiting long, gents?” he probed, but their nervous mutterings revealed nothing. Looking in the facing mirror, I watched the copper circle my chair. I could feel my heart beating – my winnings were in that pillowcase. “Crikey,” I thought, feeling a rush of blood to my head. Charlie’s blenched face sprang to life. “Oh well, must be getting along, I suppose.” The sergeant slowly moved towards the door before pausing. “There’s just one thing you might like to help with Charlie,” he said thoughtfully. “Of course officer, anything,” said Charlie obsequiously. Charlie gritted his teeth and paid up. Leaving by the front door the two policemen were joined by Uncles Arthur and Henry tiptoeing down the stairs from the now profoundly bewildered Violet. “What are you two up to – leaving the scene of the crime?” questioned the sergeant. As the story of this raid went around Woking, so I became the boy hero, albeit with the shortest haircut in Surrey.